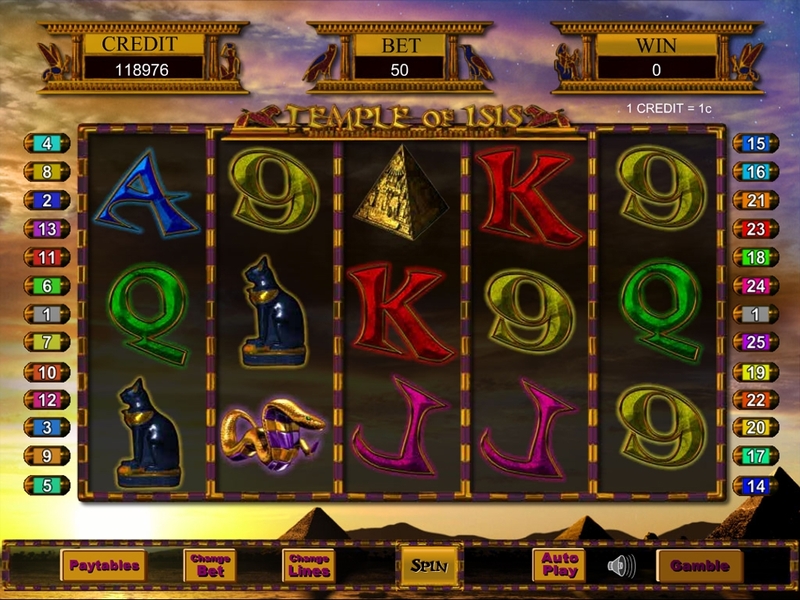 Be transported to ancient Egypt with the Temple of Iris slot game. You will encounter everything that you have come to associate with this foreign land including Egyptian symbols, the famous pyramids and a rather fetching Priestess, all complete with a beautiful sunset over the pyramids in the background. To help you on your way to finding your treasure you will find wild symbols and free spins! Get packed for Egypt. It’s easier than you think to scoop your fortune! It’s a 5 reel, 25 pay line treat which will be familiar to slots fans. The number of lines you can bet on can be manipulated with the up and down arrows after clicking the CHANGE LINES button. You can also alter the amount you would like to spend per line by clicking the CHANGE BET button and once again using the up and down arrows. Once you are happy, you can then just click SPIN and you are good to go. There is also an AUTO PLAY function that can be used to set a specific amount of spins. That way you can just chill out and enjoy the action. This function will end after the set number of spins is complete, after a bonus has been triggered or if you run out of funds. The free spins bonus can be triggered if 3 or more scattered pyramid symbols appear on your reels. This will automatically give you 15 free spins, and the best part is that your wins will be trebled! This feature can be re-triggered giving you the chance to bag loads of freebies. After every winning combination you create, you can use the GAMBLE feature. This is completely at your discretion but if you are feeling lucky it may be a good idea. You will be presented with a deck of cards and your job is to guess what you think the next card will be. If you guess the correct colour, you will get your win doubled! If you guess the correct suit, your win will be quadrupled. The Priestess symbol acts as the wild symbol in the Temple of Iris slot and will substitute for any other symbol apart from the scatter. Not only will this help you on your way to bagging some winning combinations; any wins that you do get will be doubled. We are happy to say that Cheers Bingo is a bingo site with Temple of Iris slots and we suggest that you definitely take a spin on it and find your Egyptian treasure.